Stan Getz was without a doubt one of the greatest tenor saxmen ever to take up the instrument. His professional career began at age 16 and continued until shortly before his death from cancer in 1991 at the comparatively young age of 64. In between those years, Getz recorded dozens of albums under his own name and an unknown number as a sideman. Lester Young was a big influence on Getz during his early career, and despite breaking away to find his own style later on, he never completely lost that sweet sound that he picked up from the “Pres”. 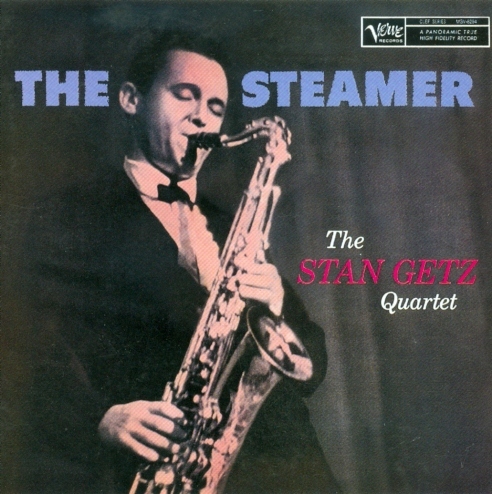 By 1956, when “The Steamer” was recorded, Getz had played with many of the biggest names in jazz at the time: Jack Teagarden, Stan Kenton, Jimmy Dorsey, Benny Goodman, Woody Herman, Zoot Sims, and on and on. The set off to a great start with the only Getz composition on the disk, “Blues For Mary Jane”. Getz is in control of his instrument to the point that his playing seems relaxed, deceptively so, while the rhythm section sets a hot pace that would have brought a live audience to its feet. “There Will Never Be Another You” follows. This is the longest track on the disk, running over nine minutes, and not one second of it is filler. This is a wonderful rendition of this song… everyone nailed it just right. My copy of “The Steamer” runs a bit over 40 minutes long. That’s a bit short for modern music fans, used to getting 20 or 30 minutes more than that on a CD. If you pick up a copy of the PolyGram reissue, you’ll get almost 14 minutes more, including two alternate versions of “How About You”, and one alternate version each of “Like Someone In Love” and “You’re Blasé”. I’m sure the alternate versions make good listening, but for my money I would rather they included five unreleased songs that didn’t make the cut for the original 1956 album, instead of five unreleased versions of songs that did. Now that would be something to hear! But you can’t please everyone all the time. Regardless of which version of “The Steamer” you add to your music collection, you will not be disappointed!